Begin the occasion with a romantic dinner at the hotel's rooftop pool bar. Like Mr. Grey, everything will have a touch of romance and impeccability. Savor the meal with a breathtaking view of the city as your backdrop. For only P3,500++, the 5-course dinner ends with luscious dessert so be ready with your own Ana Steele and Mr. Grey lines to make it more exciting. Aside from the rooftop dinner area, there are also equally romantic date venues at Marriott Manila. Cru Steakhouse is the perfect place to whisper sweet nothings to your love one, with its plush interiors and dimly lit enclave and watching your Prime Angus steak being grilled and listening to live music. Cru also serve Vegan menu, salads with organic vegetable for healthy inclined couples. Another treat awaits lovers at Marriot Cafe. There's a certain thrill as you and your sweetheart go on a hunt to find the perfect romantic dish at the cafe's overflowing selections of international cuisine that includes tempting desserts in the "Red Room," - a delectable take on Mr. Grey's playroom. Buffet prices are P2,100 nett for lunch and P2,800 nett for dinner. And this whole month of February, make your love one swoon with delight as Marriott Cafe Bakery offers sumptuous choices such as the Make Me Blush smoothie. Other Mr. Grey inspired drinks include "My More," "Love Cuff," "Restrained," and "Beseech Me." Soundtrack from the movie will also be playing at the lobby area to set the 50 Shades of Valentine mood right. 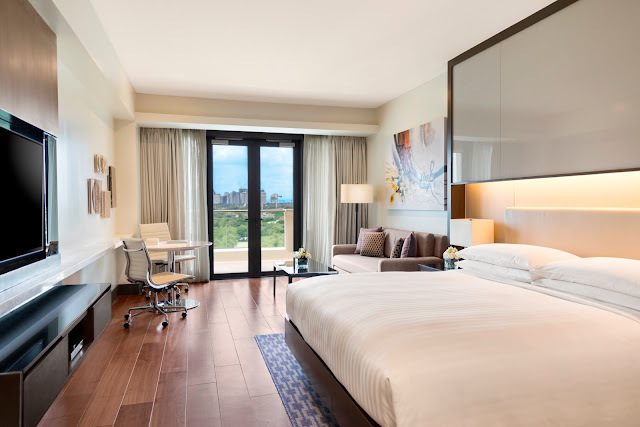 Marriott Manila also offers a romantic Valentine Room Package that begins at the special rate of P15,888++ for an overnight stay in a Premium Room with balcony. It also includes a 3-course room dinner for two with a bottle of wine and a bouquet of roses of the ladies. For more details and inquiries, call (02) 988.9999 or visit manilamarriott.com.